The Commons on Third Thursdays will activate UN Plaza, Fulton Street and Civic Center Plaza with three stages of music, food trucks, bars, bocce ball and other activities held on four nights, once a month through October, from 5 to 9 pm. “The Commons” is the name for the collective area comprising of Civic Center Plaza, Fulton Street (between the Main Library and Asian Art Museum) and UN Plaza. There will be a stage for live music in each of the three main areas, curated by Noise Pop, Another Planet and People in Plazas and food and over-21 beverages will be for sale by Off the Grid vendors. There will be bocce ball in Civic Center Park and various activities in UN Plaza. 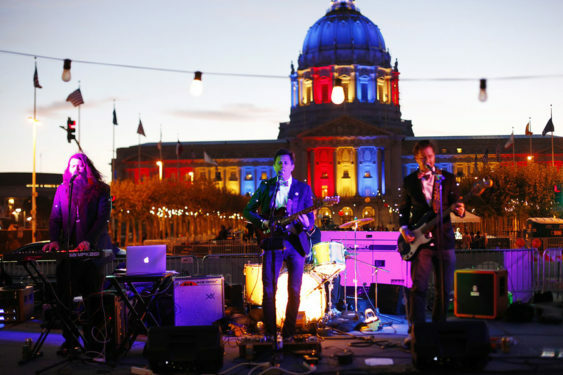 Enjoy free performances by local bands curated by Another Planet Entertainment, a full bar serving wine, beer and craft cocktails, and a rotating selection of street food curated by Off the Grid, and “beach” volleyball by SF Social. The June 21st Block Party will feature performances by Sun Hop Fat, El Duo, and DJ Funklor.